Want to Jazz up the place a bit? How about a few of these door plaques? 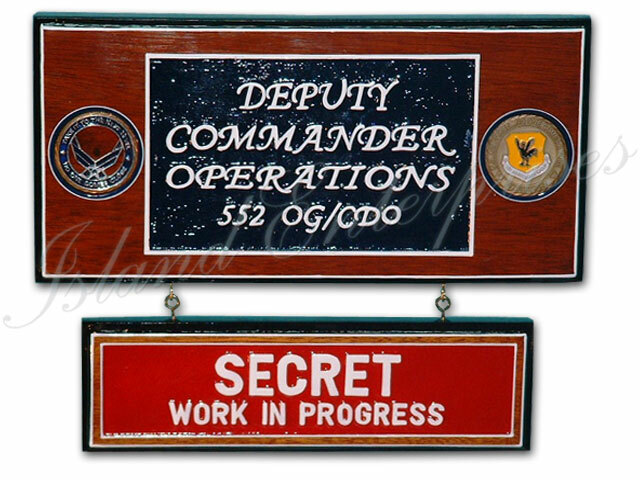 This particular version was a 6" x 12", with a 3" x 10" plaque suspended underneath done for the 18th Operations Group at Kadena Air Base, Okinawa. However you can design these plaques any way you want, with any logo or text. Prices are discounted for group orders. AND REMEMBER!!! we offer a 100% money back guarantee if you are not totally satisfied, and our plaques are guaranteed never to warp or crack.